Self-proclaimed avid anime fan since first watching Detective Conan in 2008, although probably not as avid as a true blue otaku. Let me give you an assignment. Meet at least twenty Japanese people, and ask them to name a single Japanese movie that they think is most well-known worldwide. I've tried this little experiment with some of my Japanese friends and numerous Japanese people whom I've met in language exchanges, and I have to admit that some of the answers that I got didn't sound a wee bit familiar to me, perhaps due to my lack of knowledge of non-anime/manga-related Japanese films. Nonetheless, among the many answers that I've received, three stand out the most: Hachiko Monogatari (from where Hachiko has become well-known in the English-speaking world), L: Change the World, and Spirited Away. The last of these three was the answer I received most often. Not surprisingly, really, owing to the fact that Spirited Away grossed at least a whopping $275 million worldwide and raked in at least four of the world's most prestigious awards in the film and anime industries. Written and directed by none other than the legendary anime giant Hayao Miyazaki of Studio Ghibli, Spirited Away, also known by its Japanese title Sen to Chihiro no Kamikakushi (lit. "Sen and Chihiro's Spiriting Away"), is a 2001 anime film of proportions featuring a 10 year old girl named Chihiro Ogino who is moving into a new house with her parents. While driving to their new house, her parents get lost and end up in a forest outside a mysterious tunnel. Against her own wishes, Chihiro follows her parents to explore the tunnel, only to find themselves in an abandoned amusement park and a weird, uninhabited village at the other end. 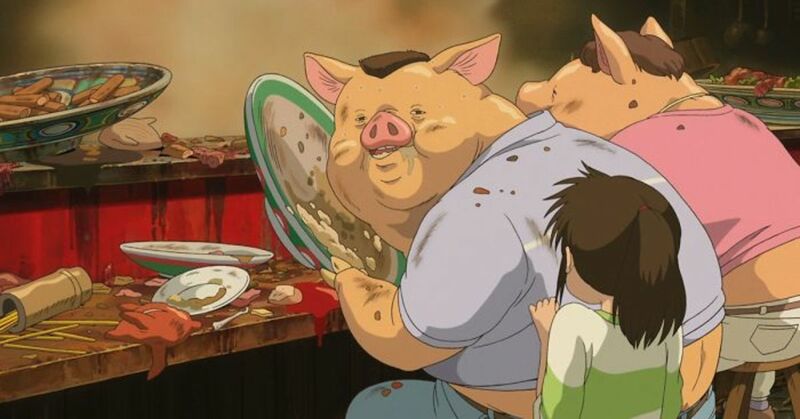 Chihiro's parents discover an unmanned eatery full of food, where they unreservedly dig in. 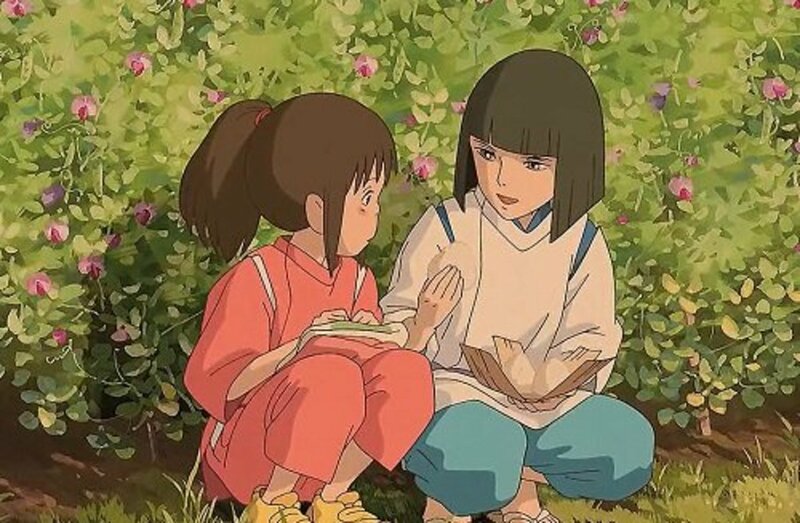 While wandering around the village, Chihiro meets a boy named Haku, who warns her to return across the river before sunset. 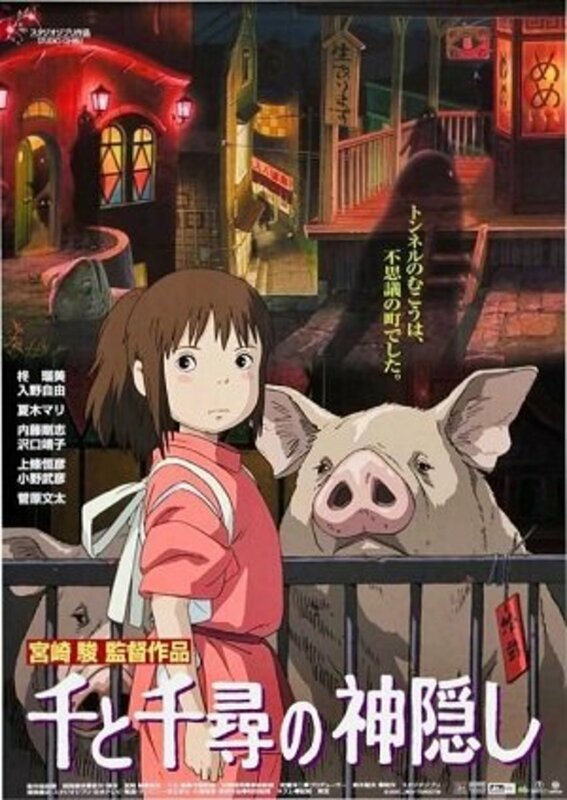 However, Chihiro later discovers that her parents have transformed into pigs and is unable to return, being trapped in the village after sunset. As nightfall comes, Chihiro discovers that the bizarre village is filled with spirits and supernatural beings, later becoming aware that she is trapped in a spirit world. Haku, realizing that he has no other choice but to give her shelter and protect her for the time being, brings her into a large bathhouse run by a tyrannical witch, Yubaba. In the spirit world, specifically in the bathhouse under Yubaba, Chihiro learns two things: firstly, that she must work or otherwise face Yubaba's punishment; and secondly, that Yubaba will rename her as 'Sen' in order to keep her in the spirit world, but she must never forget her real name, otherwise she will not be able to leave the spirit world forever. With Haku as her newfound ally in an uncanny world, Chihiro must learn more about the secrets of that world and find a way to both transform her parents back to normal and return to the real world. Spirited Away, as such, portrays the journey of a young girl, Chihiro, who, from being the young and naive girl under the absolute shelter of her parents, must abruptly assume the role of an independent, working adult in the spirit world. While she relied on her doting parents for everything in the real world, being able to just sit back and relax with the assurance that her parents will take care of everything for her, her journey into the spirit world meant a complete reversal of roles, where she must now become the responsible adult to work for her survival, and her parents (unknowingly) depended on her to rescue them. 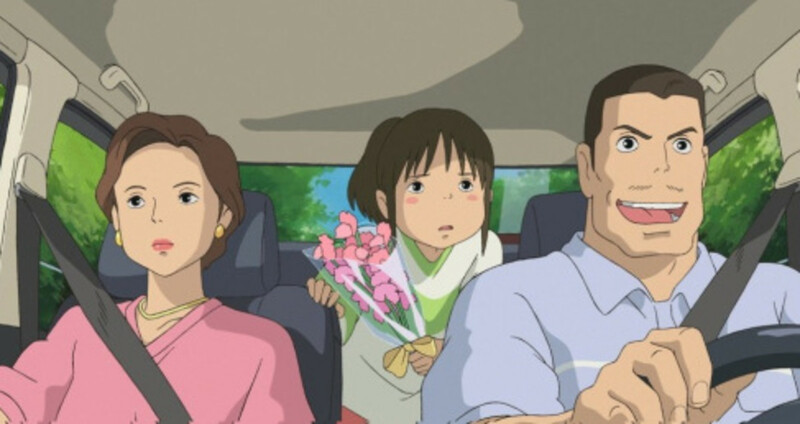 Miyazaki portrays this in a very symbolic way, likening Chihiro's journey into the spirit world to a passage to adulthood, and perhaps the reversal of Chihiro and her parents' roles in the spirit world to that of real-life reversal of child-parent roles as children grow up and parents age. Drawing from Miyazaki's words above, Chihiro also represents the fact that the ability to be independent and to fend for oneself is inherent even in young children, and that given the right circumstances that demand it, this inherent ability can be drawn out and nurtured to one's future advantage. The reverse, perhaps, is also true, whereby in the absence of the right environment that nurtures independence in children and youngsters, that inherent ability cannot be drawn out or be properly developed, which brings us to the famous scientific argument of "nature versus nurture" in human psychological development. Perhaps that is why some people out there can still be very immature and childish despite their age, especially if they have been pampered excessively since young! If there is something unique about many of Miyazaki's movies, it is the fact that such movies often incorporate elements of symbolism and personification to illustrate specific themes. 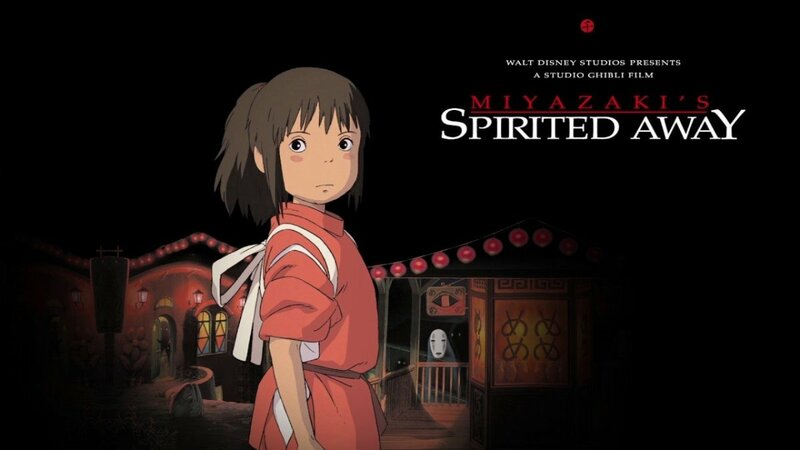 Spirited Away is no exception, but is in fact the ideal example of such a "Miyazaki-brand" movie. The various characters and settings in the movie hold different symbolic meanings, each representing a specific theme explored in the movie itself. 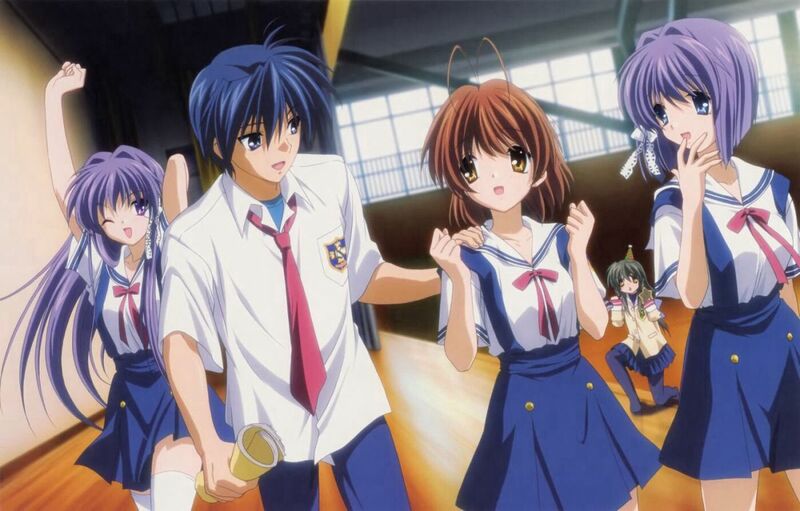 Theme of nostalgia: The setting of the movie itself strongly reflects a sense of nostalgia as one of the major focuses of the anime. The small, deserted traditional village that Chihiro and her parents stumbled upon is reflective of the fact that modern Japan is slowly starting to shift away from its long-prided traditional ways of living, as modernization consumes the nation in the name of progress and more youths leave the countryside in search for better opportunities. The bathhouse that Yubaba ran, being similar to the traditional bathhouses in pre-modern Japan, is reflective of a Japan from the past, being portrayed as a place for rest and purification for spirits after a tiring journey wandering in the outside world. This unique portrayal of the bathhouse is representative of the desire of many Japanese today who, worn out by the stresses and demands of an overly competitive environment that is modern Japan, nostalgically long for a Japan of bygone days where the pace of life was slower and the environment pristine. Modernization and environmental issues: The Unnamed River Spirit or the River God, who paid a visit to the bathhouse, can be perceived as a personification of a great river in the real world. In this era of modernization, mankind's pursuit for progress and infrastructural development is often at the grave expense of his natural environment, so much so that environmental pollution has become so rampant that it threatens the very survival of our planet. Taking the form of a filthy, muddy and sludgy creature deliberately avoided by everyone, the River God embodies the very essence of a river so heavily polluted by unscrupulous parties and the effects of modernization. Haku, who in actual fact was the spirit of the Kohaku River, is also another personification of a river destroyed in the name of development. In the ending, he stated that the fact that his river had been paved over to build apartments was the reason why he no longer had a home to return to. Innocence and impressionability: Human beings, in particular children, are impressionable beings upon which external influences shape and mould their personality traits and behavior. No-face or Kaonashi is the exact personification of this, whereby his original self is portrayed as a solitary, insignificant and shy creature, untouched by worldly influences. Nevertheless, he takes on the traits and thoughts of whoever he consumes, and learns quickly to adopt the corrupted thoughts and crooked ways of the workers in the bathhouse, thereby producing a dramatic alteration in his otherwise soft-spoken and kind personality. This is very much reflective of our worldly reality, whereby being surrounded by a corrupted environment can potentially shape an innocent, childlike character to adopt the ways of the corrupted as well, by learning through the example of those in his/her immediate surroundings. I have to confess that I'm no big fan of Miyazaki's works, despite the overwhelming popularity of his name and all products associated with him. I guess the simplistic graphics, and the simple but highly symbolic themes that are so synonymous with Studio Ghibli movies, simply don't suit my tastes in the anime world. Notwithstanding that, I have to say that Spirited Away blew my hat off and, at the very least, drew an applause from me for its uniqueness and quality. 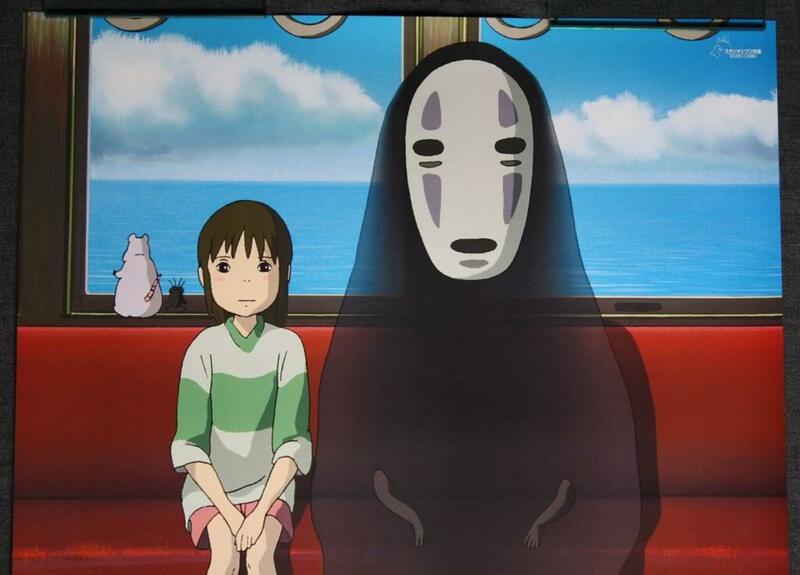 Spirited Away's graphics is very much classical of Miyazaki's style, as seen in all his other movies. This style, which is what sets Studio Ghibli's animated films apart from most other animes, features two things: realistic animated characters of proportional body parts (i.e. no exaggerated shiny eyes, elongated limbs, super-slender bodies or over-endowed body parts or countenances typical of many animes) and cinematic movie scenes, or in other words, an impression to the viewers as if the movie scenes were captured from a camera that really existed and moved around in Chihiro's world (my apologies for not being able to describe this better, since I don't know the proper terminology used to describe this concept in showbiz). It is perhaps these unique qualities of Spirited Away, and Miyazaki's films in general, that scores a unique impression above most other animes in terms of graphical presentation. 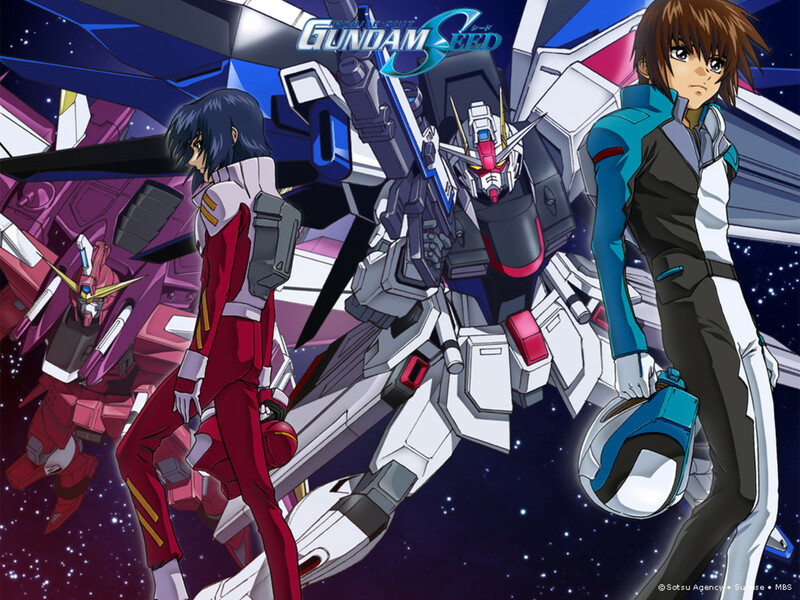 More than the graphics, however, it is the depth and uniqueness of the storyline that makes the movie such an ingenious piece of work, and its creator a genius. Spirited Away explores several themes that are very relevant to our world today, themes which both the young and the old can relate to, via symbolic portrayals of characters and settings. 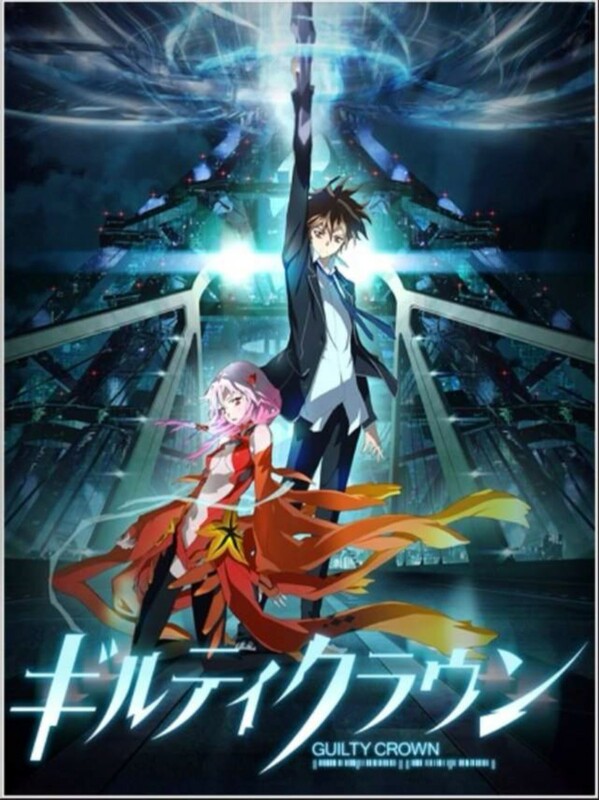 The movie amongst others, reminds us about how the new and the modern consume the old and the cultural, bringing along with them issues regarding the pollution of both the environment and the character of mankind. We can see the greed of modern mankind, represented in the form of Chihiro's parents, ravaging away at the time-honored ways and cultures of old, represented in the form of the deserted traditional village that they stumbled upon. 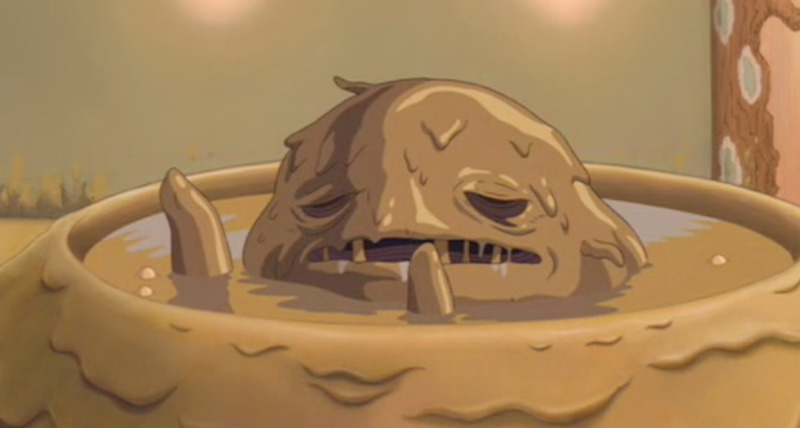 Greed, however, is not only represented by Chihiro's parents, but also by the general working populace of the bathhouse, whose cupidity for material gain encourages corruption in No-Face's initially innocent nature. 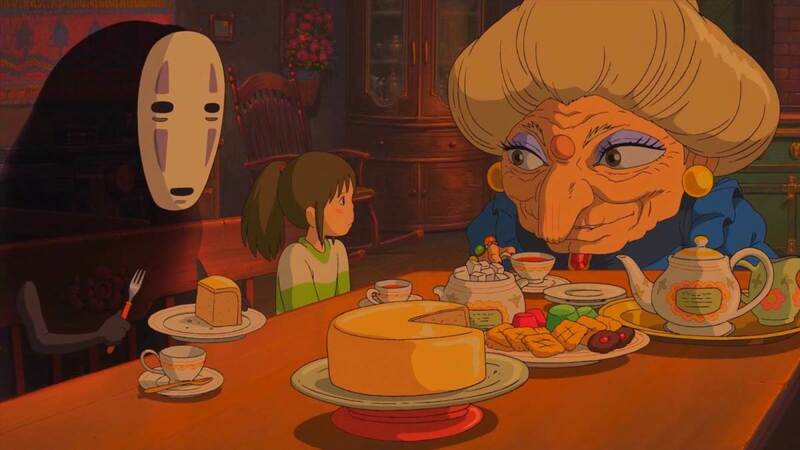 Besides the themes of the story, I am also amazed at how Miyazaki uses the movie's characters to illustrate different facets of human nature, some of which I have mentioned above. As mentioned above, the greedy nature of mankind is illustrated in the form of Chihiro's parents and the bathhouse workers, whereas the impressionable and innocent side of human nature is portrayed in the character of No-Face. 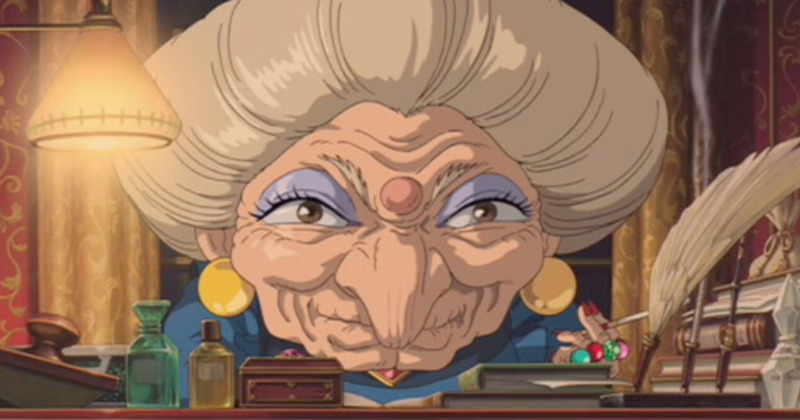 Yubaba represents the side of human nature that is filled with haughtiness, despotism and a desire for control, but her soft attitude towards her baby Boh reveals that beneath all the layers of pride and superiority in a person's character, there can still be a gentle and caring part of human nature, particularly towards one's loved ones. Zeniba, on the other hand, illustrates the other side of human nature, being like a doting, hospitable and self-sacrificing granny, and thus the polar opposite in character as compared to her twin sister. Having won, amongst others, the 75th Oscar Academy Award (2003) for Best Animated Feature, the Golden Bear in the 52nd Berlin International Film Festival (2002), the 21st Hong Kong Film Award (2002) for Best Asian Film and the maiden Tokyo Anime Award (2002) for the Domestic Feature Film Category, I take my hats off to the legendary giant of Japanese animation and his studio. Cinematic graphics with equally cinematic music background, coupled with a seemingly simple yet deeply symbolic plot, are what propelled Spirited Away to the pedestal of glory in the history of Japanese and world animation. 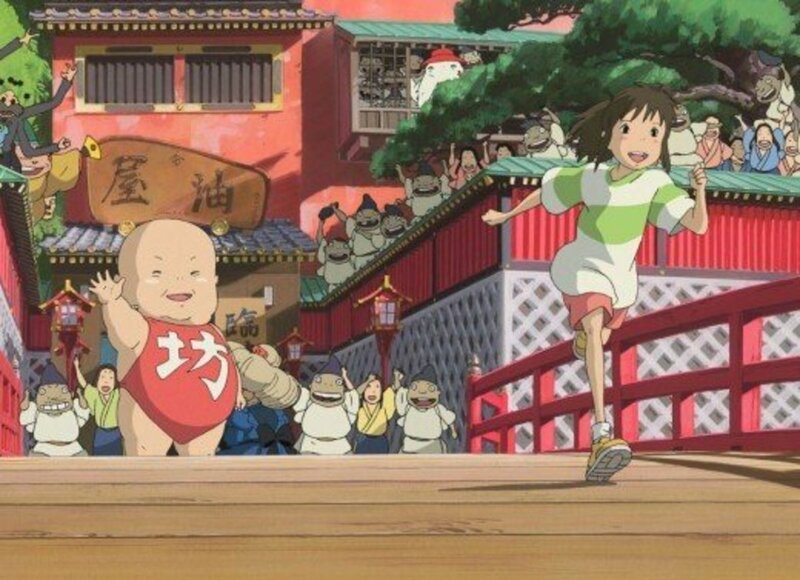 Do you think Spirited Away deserves the 75th Oscar Academy Award for Best Animated Feature? Spirited Away is a beautiful film for so many reasons, as you highlighted. 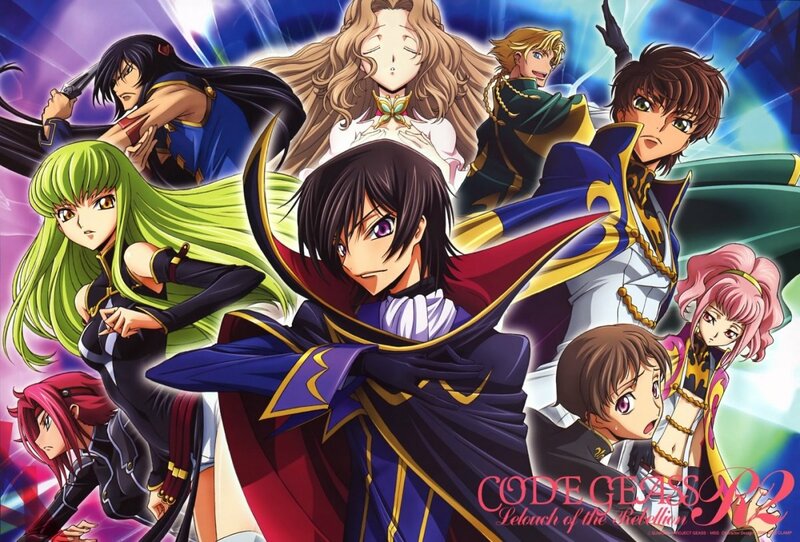 I was enchanted by it the first time I saw it and I still look back on it as one of my favorite anime (or animated) movies.